All we know VLookup function play an important role in MS Excel. It is used to search any specific value in the selected range of cells. Sometime we need to lookup few characters of one column to another. This guide helps you how to use VLookup to find first few characters in Excel. “VLookup” is one of the most important lookup functions which is located in the “Lookup and Reference” category of Microsoft Excel. For e.g. 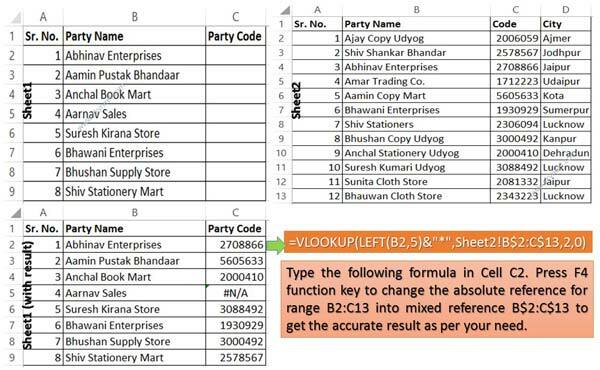 : If you have an large database in which you have to fill party code using VLookup function in Microsoft Excel. First worksheet have three columns “Sr. No.”, “Party Name” & “Code” while second worksheet have four columns “Sr. No.”, “Party Name”, “Code” & “City”. Now if you want to fill code using VLookup to find first few characters in Excel. Before using the VLookup function first we have to know the brief description of VLookup in Microsoft Excel. The Microsoft Excel VLookup function is used to search specific value in the extreme left column of the table_array. It provides the value in the same row which is based on the index number. Note: VLookup function is used to search the value of extreme left column. So, you have to arrange first column of any table or array in ascending order, otherwise VLookup function is not able to provide the accurate result. If you have a large worksheet data and want to search specific value which is based on the first five characters. Now, you have to take following few simple steps for VLookup to find first few characters in Excel. Step 1: Create following given two worksheets in your active workbook. Step 4: If you don’t want to type the formula for rest of the cells than drag the fill handle of cell C2 to C9. It will automatically copy the formula and calculate the result for rest of the cells. I hope this VLookup to find first few characters in Excel article is helpful for all Excel users. This guide is useful for those guys who are facing the problem during the searching the name which is based on few characters. If you have any suggestion or query then write us in the comment box. Thanks to all.